Anyway, I thought i would let everyone know who doesn’t already know, a bit about Traditional Yoruba weddings as i plan to have one of my own in Nigeria. First of all, if you want to marry a Yoruba lady, you must get her parents permission. So this will start off with the groom and his parents going to meet the bride and her parents to have their blessing and to agree to give their daughter to her future husband. The groom and his family will also take along gifts for the brides parents. If the brides parents dont agree with the groom, then it will not be great for him, because in order to marry her he will have to please her parents and get his permission. This is how it is done traditionally although modern day people have started slacking on this, which i think is not good. Keeping up with your tradition is always best. Soon after the meeting of the two parents, a date will be set for the wedding and planning will take place. Another wonderful thing about Yoruba weddings is the clothing. Yoruba clothing is very beautiful and colorful. 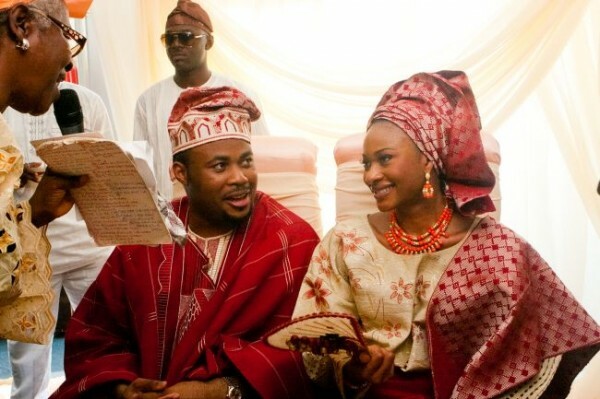 You can see some pictures below of traditional Yoruba wedding clothes. Yoruba weddings are usually large and full of many people. There will be a lot of dancing and lovely food. Also the grooms relatives will greet the brides family in the traditional Yoruba way. This is known as “Yoruba prostration”. They will lay out on the ground to show their respect to the brides family. This will take place as soon as they enter for the wedding to begin. You can see in the picture below an example. Greeting Yoruba parents in the right way is VERY important. You can read more on about this in my previous post “how to greet Yoruba parents”. Next, after they enter and greet the family, The Proposal and Acceptance, This proposal ‘letter’ is presented by the grooms family and read out loud by the youngest member of the brides family. After which an acceptance letter is given by the brides family. The groom will now enter to join the family and bride. Their will be prayers by both families for the bride and groom. 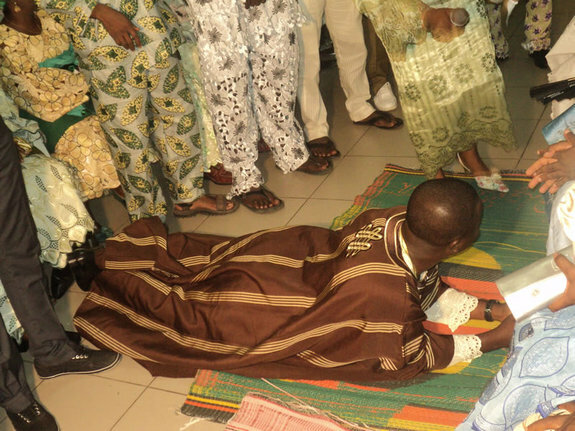 The groom will then prostrate once with his friends for his family before proceeding to his seat. Next the bride will enter, greeted and welcomed with prayers and blessings. Finally it gets down to the rings! The groom will take the ring from the bible/Quran and place it on the brides finger. Pretty much what happens in every wedding haha. i also once read about the “Bride Price”… Various envelopes containing everything from the bride price to money for the wives, children and elders in the her family are handed over to the brides family. It is very common practice for them to the envelope containing the bride price, the belief is that both families have become one and are giving their daughter away versus ‘selling’ her. So as you can see, Yoruba weddings are a little different from other weddings. I cannot wait to have my own Yoruba style wedding one day 🙂 With traditional Yoruba attire. We love traditional weddings, with their vibrant colors, rich food, playful banter and more, what’s not to like? 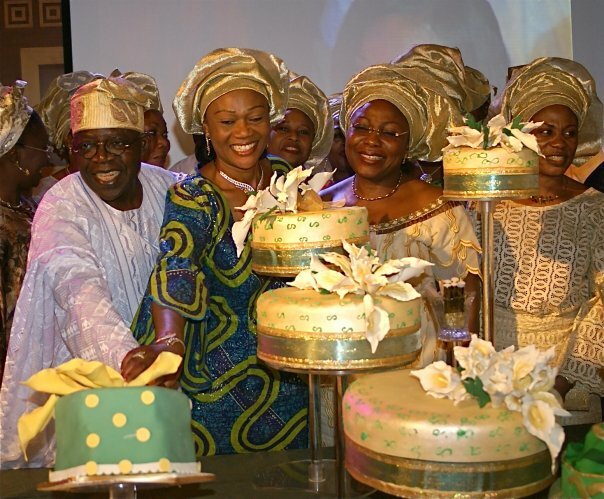 Not all Yoruba’s Celebrate weddings in the same way but the traditional Yoruba wedding is most likely to be like this. Thanks Again for all the views and comments. This entry was posted in Africa, Nigeria, Yoruba and tagged Africa, Nigeria, Yoruba, Yoruba Clothing, Yoruba culture, Yoruba Weddings. Bookmark the permalink. It’s good you’re sharing your culture. Why do you think it’s “not good” for males not seeking to please the prospective bride’s permission? Oh congratulations dear 🙂 i wish u a happy marriage! Thanks for sharing. My daughter is marrying a yoruba guy in a short while and I really needed to know all these. God bless you! 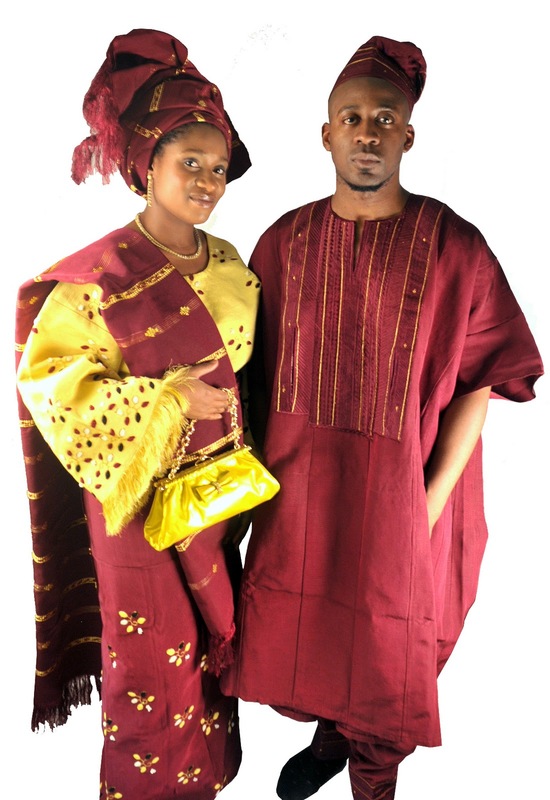 Where can I buy traditional Yoruba dresses for our wedding here in the U.S.A. Do you have any website you can recommend. I called Dupsies in Georgia already but they don’t seem to have much.